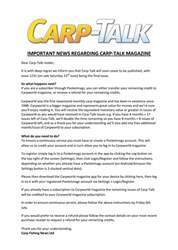 This week’s issue of Carp-Talk (issue 1027) is available to download now. 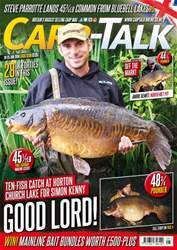 The British Carp Angling Championship continues with the sixth round of qualifiers. 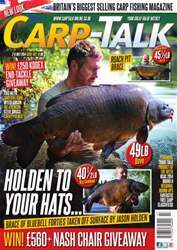 Myles Gibson offers his 10 top tips to day-ticket success, John Kneebone recalls a session to remember on Linch Hill, and Joe Atkinson has some advice on how to tempt a carp off the surface this summer. 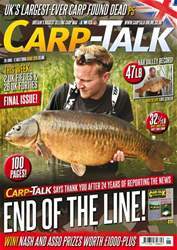 We profile a few venues worth considering for your next season, and products from Korda, Wychwood, Sticky, 30Plus and DT Bait Developments go under the spotlight in ‘Trade Talk’. Mick ‘Chewy’ French gets his opportunity to fish Horton Church Lake, and Steve Briggs makes a long-awaited return to swim 18 on Rainbow Lake. 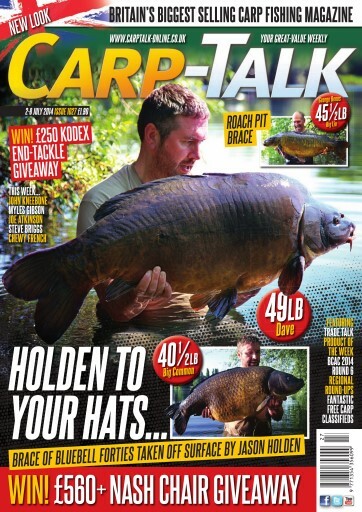 The Fox-Mainline Carp Angler of the Year competition continues, and we have got £560 of Nash Indulgence and £250 of 30Plus Kodex end tackle to give away. Also, the Nash Tackle and Gardner monthly winners are announced.